The incidence and natural course of pseudotumors in metal-on-metal total hip arthroplasties is largely unknown. 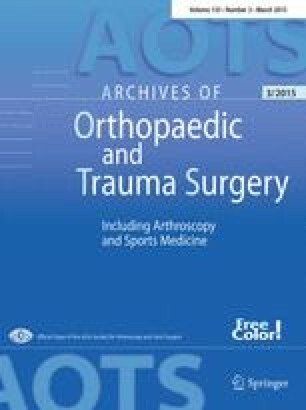 The objective of this study was to identify the true incidence and risk factors of pseudotumor formation in large head metal-on-metal total hip arthroplasties. Incidence, time course and risk factors for pseudotumor formation were analysed after large femoral head MoM-THA. We defined a pseudotumor as a (semi-)solid or cystic peri-prosthetic soft-tissue mass with a diameter ≥2 cm that could not be attributed to infection, malignancy, bursa or scar tissue. All patients treated in our clinic with MoM-THA’s were contacted. CT scan, metal ions and X-rays were obtained. Symptoms were recorded. After median follow-up of 3 years, 706 hips were screened in 626 patients. There were 228 pseudotumors (32.3 %) in 219 patients (35.0 %). Pseudotumor formation significantly increased after prolonged follow-up. Seventy-six hips (10.8 %) were revised in 73 patients (11.7 %), independent risk factors were identified. Best cutoff point for cobalt and chromium was 4 μg/l (68 and 77 nmol/l). This study confirms a high incidence of pseudotumors, dramatically increasing after prolonged follow-up. Risk factors for pseudotumors are of limited importance. Pain was the strongest predictor for pseudotumor presence; cobalt chromium and swelling were considered poor predictors. Cross-sectional imaging is the main screening tool during follow-up.